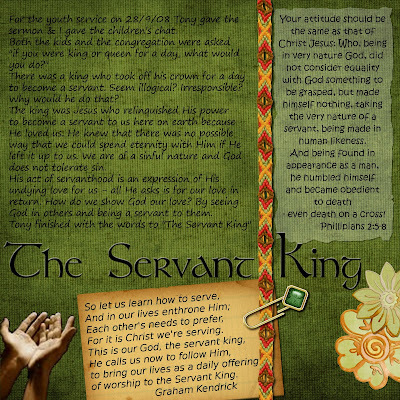 A while back I did a sermon on the Servant King; based off a Philippians 2 reading. Sandy has done up a faithbook for it already, but I've finally got all the notes back together to put up. - Who wears a Crown? - What would you do if you were King / Queen for a day? - God is the King, he became a servant through Jesus. Any clearer? - Did Jesus come down to be a slave? or a servant? a voluntary servant? - Jesus could clearly see through the temptation because his heart and soul were focused on love for us. Understood his power was not to be mistreated. For selfish reasons. There were no shortcuts to make us love him back. Why inherit the world if you destroy the people you came to save? Jesus only had eyes on the prize; to save us from sin. To break us out of our love for ourselves and to see God in others. - Jesus didn't come down to demonstrate service. Didn't say :look at me, this is the way to do it". He genuinely loved others and service naturally flowed. - Serving in the Army, voluntary service. Life on the line. - God LOVES us. Loves us so much he sent his son. That is his service to us. We can't spend eternity with God without Jesus clearing away our sin. We love God back by seeing God in others, and serving others with God's love.